Though we have yet to quantify the intangible quality players refer to as team chemistry, even the most statistically driven among us cannot rule out interpersonal dynamics as a factor in a team’s overall performance. Beyond the sabermetric community’s desire to understand and quantify the game, giving weight to team chemistry is a way to connect with our favorite team. It’s a way to humanize players who possess seemingly superhuman abilities. They’re human, just like us! And who among us doesn’t benefit from a positive, fun work environment? Generally speaking, discussions about team chemistry revolve around the 25 players in the major league clubhouse. It’s difficult to take 25 different personalities into account, and arrive at one value. Many people have tried, and as Russell Carleton’s extensive work in this area has made clear, group dynamics is a massive field of research unto itself. Not only are we trying to quantify team chemistry and determine whether or not it is helping or hurting our team, we are trying to figure out what goes into that chemistry. Players spend a great deal of time together, whether it’s in the clubhouse or in the dugout or on the team airplane. The behind-the-scenes goings on of a team seem to contribute greatly to the quality of its chemistry. Sometimes we attribute a good working environment to a fun personality, whether it’s a jokester or a playful character. Other times, we attribute it to the presence of veteran leaders. We all seem to agree that it emanates from the players or coaches, or both, and its advocates suggest that good team chemistry, productive team chemistry, will result in a positive benefit over the course of a season, in the form of… wins? This is where sabermetricians cringe. We know we want to measure this thing … but we haven’t decided how to measure it, or even exactly what it is that we’re measuring. It’s akin to asking a toddler to describe an imaginary friend, at a time when the toddler has yet to fully grasp the boundaries of reality, and doesn’t quite have full command of the language or lexicon. We’re asking to measure this intangible factor – which could be a collection of intangible factors; we haven’t really decided that part, either – by a metric we know to be an oversimplification of the game. If we want to understand team chemistry – the je ne sais quoi that allegedly accounts for a team’s overall performance beyond that which we would expect from the baseball talents of its individual players- we need to start small. The expression “the whole is greater than the sum of its parts” can apply whether we are looking at 25 parts or two, and it stands to reason that understanding how the parts interact with one another will give us insight into the potential of the whole. 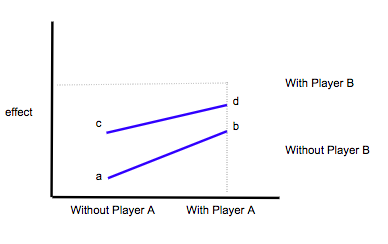 Instead of looking at the interpersonal dynamics of 25 players, and the way each player interacts with the 24 other players in the clubhouse, perhaps we should begin by looking at the interpersonal dynamics of just two players. We may or may not be privy to tales of buddies in the locker room, or off-season friendships. But we have plenty of data for measuring performance, and we can look at the performance of two players who interact with one another on the field. Of course, looking at how two players on the field perform with respect to one another has been explored before, most notably by Tom Tango’s With Or Without You (WOWY) method, which he describes in The Hardball Times Baseball Annual 2008. In one piece, Tango introduced the concept of WOWY, and in the second, Tango looked at how one player in particular, Derek Jeter, compared to others. This type of analysis is a basic way to look at the effects of a single variable (a player) to a control (all other players). 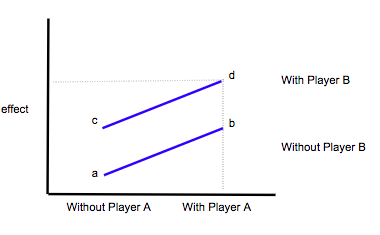 As Max Marchi noted in a subsequent Hardball Times story in 2010, “Tango proposed the WOWY (With Or Without You) method as a way to separate the effect of two actors on the same play.” Marchi furthered the WOWY analysis by using mixed models to take into account various confounding factors, and subsequent approaches have become more specialized, focusing primarily on catcher metrics. With the use of mixed models, this herculean task can more narrowly consider the contributions of the individual catcher, as we can consider a catcher’s battery mate, the umpire, and play conditions, among other factors. Generally speaking, these catcher metrics try to tease out the other variables that may contribute to performance, and our valuations emphasize an individual’s contributions to the game. Obviously, this is valuable, but players aren’t playing in a vacuum, and we would be remiss if we completely overlooked the interactions among players. And if we want to determine whether or not team chemistry actually exists, we would be well served to find a standard by which to determine whether or not the play on the field is the result of chemistry, or merely what we’d expect from the players at hand. Synergy, [sin-er-jee]; noun, plural synergies. the interaction of elements that when combined produce a total effect that is greater than the sum of the individual elements, contributions, etc. ; synergism. Physiology, Medicine/Medical. the cooperative action of two or more muscles, nerves, or the like. Biochemistry, Pharmacology. the cooperative action of two or more stimuli or drugs. The concept of the interaction between individuals providing an enhanced effect – or synergy – certainly isn’t exclusive to baseball. In the business world, one might evaluate the merger of two companies, or the acquisition of one company by another by the degree of synergy, with the end result being a corporation producing even more widgets than the two companies would have produced individually, all while making significantly more money. The general idea is that a combination that results in a greater than additive or expected effect has synergy; think of a team that outperforms its Pythagorean win expectation or pre-season projection. But look to the second and third definitions – “the cooperative action of two or more muscles, nerves, or the like,” and “the cooperative action of two or more stimuli or drugs.” Indeed, a quick search for the word “synergy” in PubMed is evidence of just how important the concept is to the biomedical field. For example, using two different drugs that have two different mechanisms of action can be a very effective way to treat cancer; by measuring the effects of a combination of two drugs, we sometimes observe a synergistic therapeutic benefit, that is, an effect that is greater than the sum of the effects of the two drugs if they were administered individually. We also see the concept of synergy in herbicides and pesticides, which are often used as a mixture of two or more compounds. 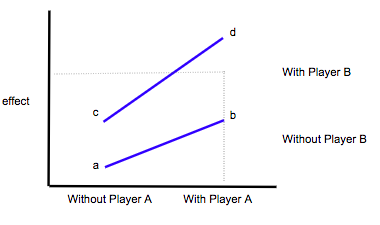 With Player A and With Player B. There are a number of models and equations that scientists use to evaluate combinations, and to determine if they’re just additive, synergistic, or antagonistic. They’re not perfect, but at their most basic, they try to account for small sample sizes so as to maximize the information gleaned, whether it’s for factorial experimental design, or to evaluate whether or not a combination of drugs is benefiting a patient. 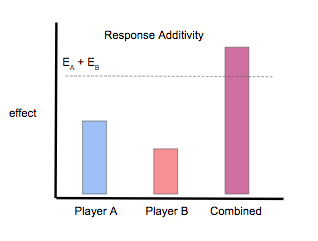 While the more complex models for drug combinations won’t parallel evaluating combinations of baseball players, using the same thought process could provide insight regarding the interaction between two players in order to determine which player combinations perform better than their individual numbers indicate. The synergistic combinations might be the result of chemistry, or perhaps they shed light on an underappreciated combination of skill sets between two players. 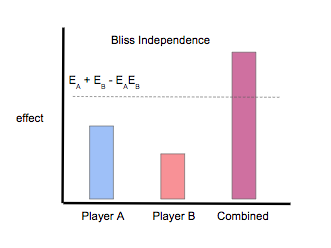 A simple way to evaluate a combination is simply to look at the effect of the combination relative to the effect of the higher performer – this is the Highest Single Agent model, which considers a cooperative effect, but assumes that the the expected effect is merely the highest effect of either Player A or Player B. In other words, the expected performance of the duo is just what you would expect from the highest performer, regardless of the second player. For a baseball example: a catcher may have very little influence on an ace pitcher’s performance; in this instance, the overall performance of the battery may not vary significantly from the pitcher’s performance with other catchers. But an ace pitcher with a particular catcher may outperform the ace pitcher’s performance with other catchers; in this scenario, there may be synergy or enhancement in the combination of the ace with this particular catcher. Similarly, if the pitcher underperforms with a particular catcher, and is less effective, we would say that is an antagonistic interaction between the pitcher and the catcher. When the overall effect is worse than you would expect from the two players considered individually, that’s an antagonistic interaction. But if the overall effect is better, that may be synergy at work. For a baseball example, we obviously can’t just add up a center fielder’s defense with a right fielder’s defense – there’s going to be literal overlap in the territory they cover in the outfield. 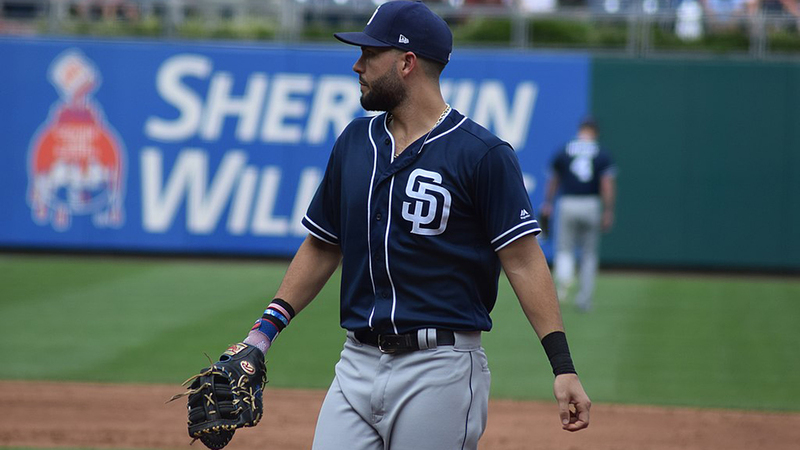 But perhaps a particular combination of outfielders can cover a larger total territory, and make more difficult plays, than they would when playing with another outfielder. There may be some kind of connection there, where one player has a better feel for what the other is or is not capable of, and what plays he can realistically make. Perhaps this element of trust between outfielders results in synergy, and the two players in combination are able to provide a greater than expected defense. Again, for now this is purely a conceptual exercise. But the overall concept of synergism, and the interactions between two players, should be considered, as baseball is a team sport. Perhaps what we think of as chemistry is actually the result of a combination of under appreciated skills matching up in an unexpected way. It’s easy to conceptualize the dynamic between a pitcher and a catcher, and in certain scenarios, it’s easy to recognize that certain pitcher skill sets require certain catcher skill sets. We obviously recognize that certain catchers are more capable of working with knuckleballers than others; maybe catcher framing doesn’t matter as much to certain pitchers based upon their repertoire. More generally, however, certain catchers may be better at calling games; maybe certain pitchers are more likely to call off one catcher than another. Perhaps that interpersonal dynamic and level of implicit trust between a particular pitcher and particular catcher results in a performance that is improved over either player in combination with another. As observers of the game, we accept that pitchers and catchers may benefit from that interpersonal connection; we see the pitcher and catcher communicating on the field, whether verbally or through a series of signals, nods, and shakes. But the synergy analysis could also be extended to examine other roles that wouldn’t obviously benefit from the pairing of complementary skill sets. In theory, two players who have very little interaction on the field shouldn’t affect each other’s performance. For example: a pitcher and a left fielder wouldn’t interact very often on the field, so their performance together shouldn’t differ from their performance as two separate parts; there shouldn’t be a synergistic effect. But perhaps the two players benefit from their combination, and improve their play, even though they’re in disparate roles – that’s synergy. On the other hand, if you realize that their performance is much worse when they’re both playing, that might be an indication of negative interactions, or antagonism. Synergy is purely descriptive, and not predictive in nature. But perhaps in assessing the truly surprising, synergistic pairings, we can determine what factors lead to these synergistic combinations. Sure, you can pair your ace starter with a catcher with exceptional pitch framing capabilities, and you would expect them to do well. But wouldn’t you expect two players with elite skills to perform well? This is where looking at synergistic relationships comes into play. Perhaps there’s a back end starter and a ho-hum catcher… but they work exceptionally well together; indeed, much better than you’d expect. Or maybe there’s a pair of players who have very little interaction on the field – and yet, their performance on the field is enhanced when they’re both playing. That’s synergy. Stephanie Springer is an organic chemist turned patent examiner. Follow her on Twitter @stephaniekays. Synergy is just one of those areas we’re not going to be to measure, and that’s ok. The unpredictability of sports is a good thing, sport is one of the few forms of entertainment which isn’t scripted. It’s bad enough seeing those win probability percentages graphics when watching baseball on television. Sport is the only form of entertainment where performance in principle can be understood entirely in mathematical terms. The biggest obstacle to quantifying synergy may be just that the effect is small relative to the inevitable random noise. I’m thinking this has better application for other sports, where it’s harder to disentangle individual performers, i.e. hockey. But at some level this could be useful, particularly with respect to management. The problem with measuring chemistry on a sports team is you aren’t sure what you are measuring. Is it the fact that players like each other? Or is it just, as the author suggests, certain symbiotic relationships between particular players? There have certainly been teams riddled with dissension (non-chemistry) in the clubhouse that have been successful (see Jim Bouton regarding the early 60s Yankees). Maybe it’s just a matter of particular skills that coalesce at a point to produce wins.